It is time for another Throwback Thursday. For those of you that are new to this, TBT is a linky that is held the first Thursday of each month. It is super easy. All you have to do is repost a blog post that you have previously posted. Include the date of the original post and the button above. That is all you need to do. Then come back and link your post to our linky below. The following post was posted back in 2012. 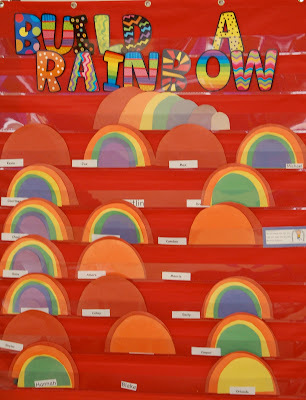 I still use the following rainbow behavior system in my kindergarten classroom. It reinforces positive behavior and follows PBIS. As you may already know, our school is a PBIS school. We teach positive behavior interventions and supports. Our first day of school is always the day of our PBIS kick-off. All teachers in our elementary school wear PBIS shirts to show our pride with this behavior system. Teachers set up in stations to practice expectations to all students in the school. Our school has a school-wide classroom matrix. The matrix is posted throughout the building. It is posted in the bathrooms, hallways, gym, cafeteria, library, art room, music room, office, and every classroom. Our PBIS team and classroom teachers came up with the matrix through many meetings and observations. 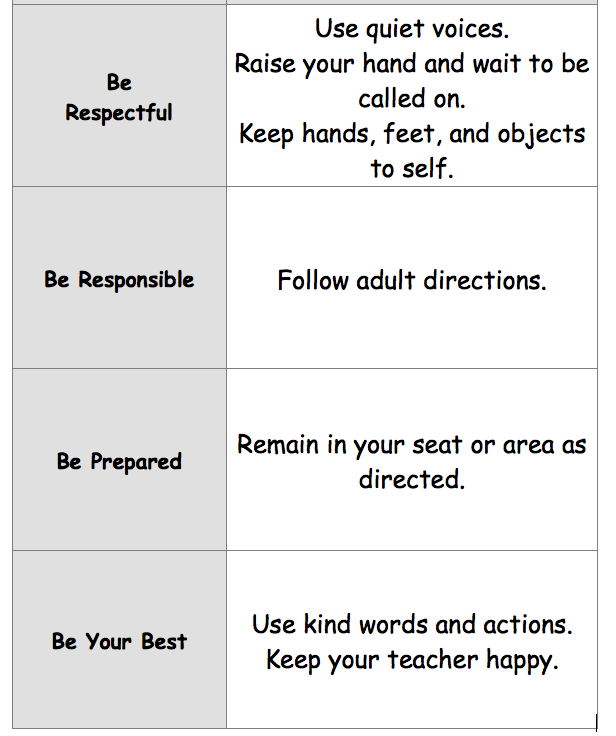 The four major "Be's" are Be Respectful, Be Responsible, Be Prepared, and Be Your Best. Each classroom has the matrix with expectations posted in the classroom. After careful discussion and LOTS of practice, each teacher develops an additional classroom matrix. I have included my classroom matrix below. I have this chart posted in my classroom. As a class, we also created the same matrix on chart paper. We will refer to this matrix for rules and procedures throughout the school year. If you are looking for more information for your school, please visit this website. In addition to PBIS, I award students with Build Your Rainbow. The rainbow behavior chart was inspired from Mrs. Lee's Kindergarten. Click here to see how she uses it in her classroom. 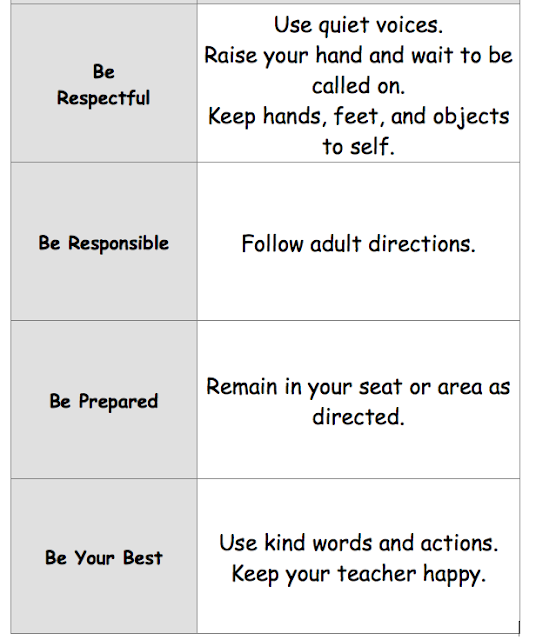 It is a positive visual for students to view behavior. When students complete their rainbow, they get to visit the "pot of gold". The pot of gold is the prize box. In the prize box, students can choose from pencils, candy, small toys, or other items. It is not a lot, but the children are proud of whatever it is they earned. I haven't been blogging long enough to have any posts to 'throwback' to, but what a great linky! And I love the rainbow behaviour chart, I will have to keep that in mind for next year. Thanks for the linky. We began PBIS this year, so thank you for the idea. The build a rainbow is cute. I used this when I taught Kinder a few years back and it really works! It's nice to promote good behavior in the classroom and encourage our friends to be good examples! I'm excited to link up with you here!